Years ago, in the distant past, when I was a young girl, I couldn’t imagine not wanting to go trick or treating on Halloween. I fretted ab0ut growing up and not being able to do it any more, because it wasn’t a thing “grown-ups” did. I loved running around in the dark from house to house, especially when one of the houses was “spooky”. I loved the wind, the dark scary shapes, the huge orange orb of a full moon. Oh what a sacrifice that was going to be, not to be able to do that. In fact, I thought, maybe I would never give it up! It was a time to get together, dress up, play games, carve pumpkins and run about in the night geting candy. Harmless. We all knew what we believed with regard to the spiritual realm and it wasn’t like we were worshiping the devil or anything. It was just a fun, cultural thing…. And yet as the years have passed my acceptance became ambivalence and lately, the ambivalence is turning to active dislike. I read an article the other day that Halloween is now the second biggest holiday celebration — in terms of money making — in this country, second only to Christmas. (There’s something disturbing about that juxtaposition.) When I went looking, I couldn’t find that particular article, but turned up another, written today (Sunday, Oct 30) that cites the National Retail Association as their source for this same claim. According to Neilson research, we’ll buy about 600 million pounds of candy for this day, and spend even more decorating our homes and buying/making costumes. People say we love Halloween so much because we’re still kids inside. Because we love to dress up. Because it’s a time to be together, something to do as a family. As a neighborhood. Others say everyone loves to be scared. Sorry, no. I detest being scared. I detest having horrid, bloody images burned into my brain that will float around with me for years. Which is why I won’t go near the chain saw massacre haunted house things. But those are huge money makers as well. Yes, I did say above that I liked spooky houses, but that’s fake spider webs with fake spiders in them, grinning jack-o-lanterns, shadows, fake bats, spooky ridiculous music, and glowing eyes that are electric and not set in the skull of some powerful predator slowly stalking me. In other words, it’s really fake-scary. I like pretending something is scary. I have no use at all for things that are really scary. Fear is a sin. Anxiety is a sin. So is being terrified. Yet we have as the second biggest money maker, a holiday that celebrates fear. Or is it fake fear? And yet… for all the scary stuff, kids get candy. And, at the same time, they learn gradually that all this scary stuff… zombies, witches, monsters, vampires, devils, demons, evil spells, evil powers, mummies, ghosts… aren’t real. That all that supernatural evil stuff is just silly, harmless stuff. Halloween makes all that seem silly and ridiculous. Satan is reduced to an absurd figure with horns, a forked tail and red skin, who roams about in a red cape with a pitchfork. Witches run about with long noses and pointed black hats. Everyone laughs and has fun. Kids get candy. It reminds me of the post I did on Hopi religious ceremonies for the kids, where every time the kachina shows up, the kids get the equivalent of candy. Thus they come to associate the kachina with gifts and good things and pleasure. So Halloween, I think, moves kids to associate demons and dark forces and witches and vampires and even death as not real, and also, as fun, as something pleasant and tasty. And there’s just something off about that. When I think about us as believers in Christ being royal priests, being in union with the God of the universe, children of God, beneficiaries of His grace and created to be the means by which God would solve a great battle waged against him by evil angelic beings… it doesn’t seem right to engage in a holiday that seems deliberately crafted to meld the real with the make believe, and wrap it all in the guaze of fun and togetherness and the Pavlovian reward of … candy! Not that I’m going to go on any anti-Halloween crusade. I just don’t like it. But I think I may have some legitmate reasons for feeling as I do. 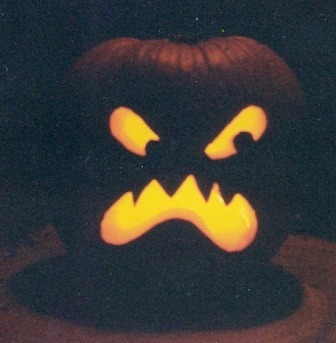 UPDATE: While dinking around on the internet after posting this, I came across this blog from a former Wiccan, now Christian who wrote a series on the origins of Halloween in Samhain, a Celtic religious end of harvest festival. Very interesting. You can read Part 1 HERE. There are three parts and they’re all quite interesting, especially where she points out the counterfeits with Christianity. This entry was posted in Angelic Conflict, culture, Holidays and tagged costumes, Deception, evil, Halloween, money maker on October 30, 2011 by Karen Hancock. Great post! It’s true that Halloween celebrates darkness and monsters and demons as a joke, and most Christians I know do not take it seriously. They involve themselves in celebrating the day or some even come up with substitutes when they finally feel they cannot celebrate Halloween anymore. I think the day for celebrating darkness and fear should be ignored altogether by us Christians. Christians do not question these things of the world often enough, so thank you for being the Christian that does.